Galleri Feldt’s drawing cabinets were designed by Poul Kjærholm as part of a 1955 commission from the Architecture School at the Royal Academy in Copenhagen. Each composed of an Oregon pine box with nine drawers (built by Rud. Rasmussen) resting on a frame of molded steel angles, they—together with the two desks included in the commission—constitute a crucial step in the designer’s aesthetic evolution, and a turning point in an uncertain moment of his career. Kjærholm graduated from the School of Arts in Crafts in 1952 with a very successful final project (the “Element” Chair or PK 25), and was immediately hired at Fritz Hansen. During his time there, he produced several chair designs that, though innovative, did not go into production. He left the job less than a year after he started, and over the ensuing three years he struggled to make a living and tirelessly experimented with designs featuring industrial materials, the majority of which, again, remained in prototype form. After repeated frustrations, the Royal Academy commission turned things around; shortly following it he established a partnership with manufacturer E. Kold Christensen, which finally, in 1956, allowed him to produce two of his most iconic and commercially successful designs—the PK 22 lounge chair and the PK 61 low table. That Kjærholm’s career was boosted by designing furniture for architects has a symbolic quality: desks and cabinets are the places where creative labor happens, where ideas emerge and accumulate. The accumulation of Kjærholm’s ideas over the course of his education as a cabinetmaker and through his experimentation with industrial materials is evident in the cabinets’ wood and steel ensemble. Their reduced forms display above all the character of their materials, but also presents—particularly in the integrated drawer pulls and hand-cut dovetails and—high quality craftsmanship. 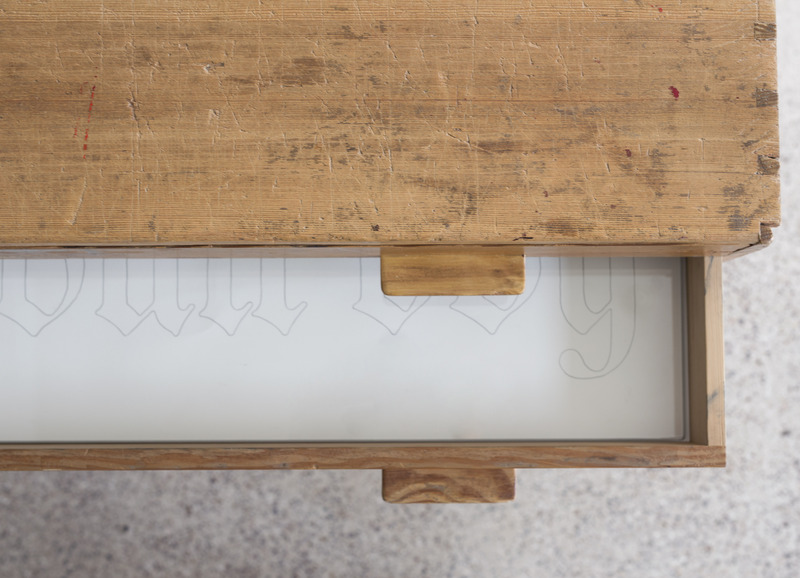 As an intervention in the two Kjærholm cabinets, Danh Vo’s father, Phung Vo, has drawn the phrase “All work and no play makes Jack a dull boy” in pencil on paper 18 times—once for each drawer of the cabinets—in large outlined blackletter script. This script has been used repeatedly (with modifications) in many of Danh and Phung’s collaborations, and as in past examples, the tension in the cabinet drawings between the form of the writing and its content points to latent historic and aesthetic dissonances. In terms of content, we have an infantilely worded, benign cliché that, because of its role in Stanley Kubrick’s 1980 film, The Shining, has become an iconic—though often ironic—expression of violent derangement. In terms of form, blackletter font exudes a feeling both solemn and sinister: used in copying the Bible in the Middle Ages, it has since has been put to many unholy and trivial uses. 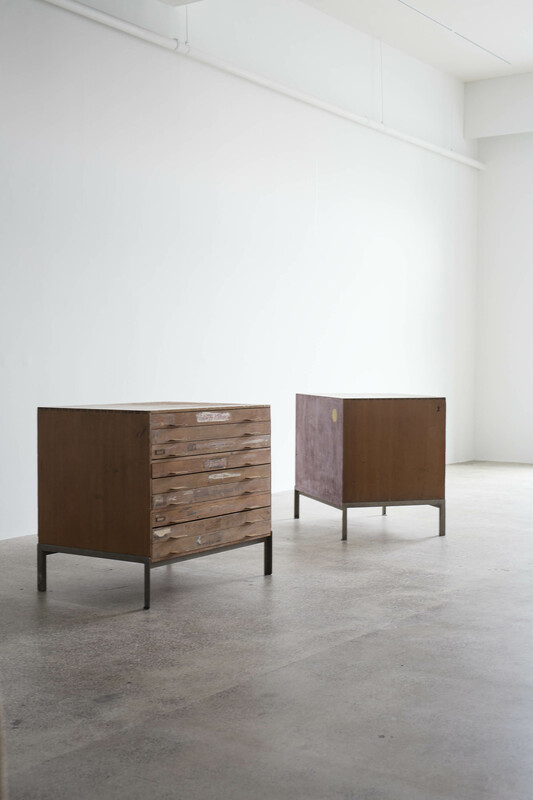 Now occupying the two Kjærholm cabinets, blackletter is again used perversely, and this perversity is embedded in many aspects of Danh Vo’s intervention. The cabinets, for one, which are supposed to participate in the architectural work process, have been taken out of commission and become “works” in themselves. The drawings that they currently contain are created with meticulous uniformity by a single, known hand, making the absence of the diverse works produced by anonymous students that had been housed in the cabinets through they years keenly felt. Also felt is the topsy-turviness in Phung and Danh’s collaboration, which performs a reversal of conventional familial power dynamics: here it is the father who carries out the role of the student, and who appears to work at the behest of the son. 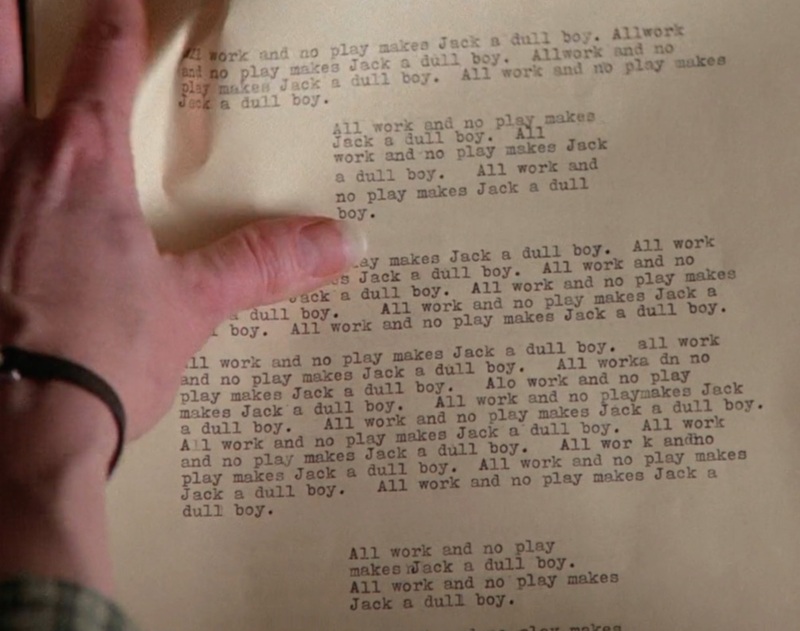 When Jack Torrance’s wife, Wendy, starts flipping through the tall stack of pages that constitutes her husband’s literary output over at least a month, she discovers, to her horror, that all it amounts to is “All work and no play makes Jack a dull boy,” typed incessantly on countless pages. In his professional and creative frustration, Jack, she discovers, has gone mad and authored nothing: he has obsessively repeated a proverb complaining about work that ironically reveals how little he has actually worked. Though meaninglessly repetitive, his “work” is, however, creative: almost every page has different formatting, with fluctuating line-, word-, and letter-spacing and varying paragraph length. Some parts masquerade as critical literature, with verse quotes interspersed within the prose, and one page with triangularly shaped text blocks resembles concrete poetry. Having forsaken the ambition for original substance, Jack engages in a visual exercise that—in another layer of irony—imitates the form of a literary work, but screams the absence of sense. It is partly this divorce between form and content that makes Jack’s project so creepy, while another contributing factor is the typos that dot the document, creating either nonsense (“dllboy”) or accidental new meaning (“dull bot”): Jack’s mind is so utterly distracted and dull that he can’t even focus on the details of his formatting games. Conversely, though, the typos display Stanley Kubrick’s meticulous attention to detail, which allegedly drove him so far as to film alternate versions of Jack’s document in different languages, so that the impact of the visual repetition and form-content divorce won’t be lost on Italian, German, Spanish, and French audiences. And his perfectionism famously led him to film so many retakes—in this film and others, but especially with Shelley Duvall, who played Wendy—that his actors’ psychological defenses would be totally broken by the physical and mental wear of repetition. Kjærholm’s aesthetic requirements for his drawing cabinets came at the cost of durability: the drawer pulls were too delicate, and the Oregon pine too soft for the heavy use they were supposed to weather. Now they bear the marks of generations of students’ work—the same movements repeated over the years by different individuals. The deep cuts grooved onto the cabinets’ tops from knives slashing countless pieces of cardboard have given the wood a leathery texture. Paint spilled or flecked everywhere hints at the messy activity that surrounded them. 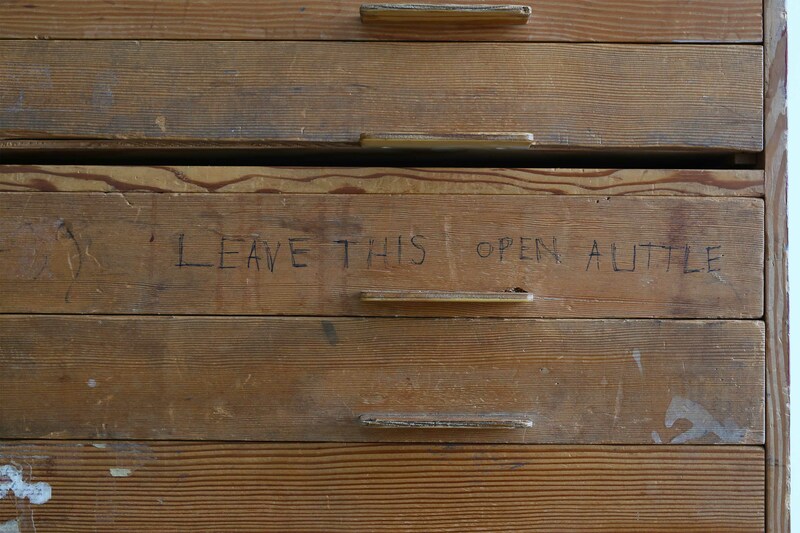 The message “please leave this open a little,” carelessly written in black marker on one drawer, conjures the frustration of trying to pry open a drawer constantly getting stuck once closed. Several names written or carved directly on the wood, or still visible on vestiges of partially peeled-off masking tape labels, convey the sense of ownership the students felt over their respective drawers, competing with the institution that branded its logo on them. The ghostly remains of adhesive from names that have been removed makes the presence of those that have survived feel paradoxically ephemeral: their preservation is merely coincidental, and while they remain frozen in time, the people they stand for have changed in ways we can’t know. For the students, the cabinets’ materiality was subsumed in their function; they saw themselves and their work reflected in them. The patina that they unhesitatingly left on them is so complex and actively wrought that it transforms these two cabinets from design objects into unique artifacts and palimpsests of creative presences.